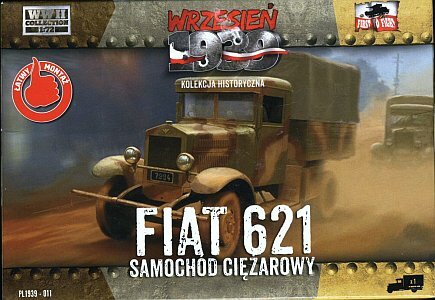 Although described simply as a FIAT 621, this is actually the Polish licence-built Polski Fiat 621L (PF 621L) 2.5-ton 4x2 truck, which was the most common truck in the Polish Army in 1939. The kit presents a main (mid) production variant with an old-style cab with ventilation grates behind the doors, and short side steps. 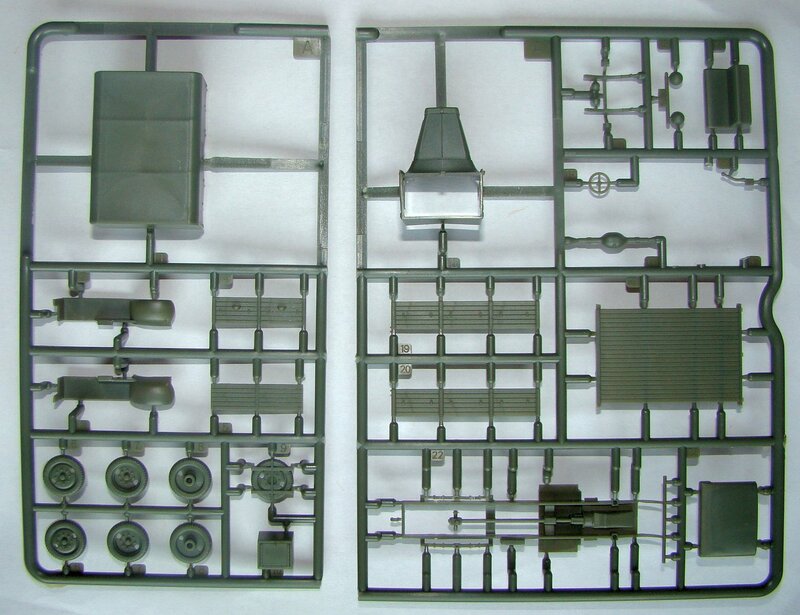 This kit, released in 2014, is the first injection model of this vehicle which up to now was only available as a resin model by MarS which is over 15 years older (an article on the MarS kit can be read here). 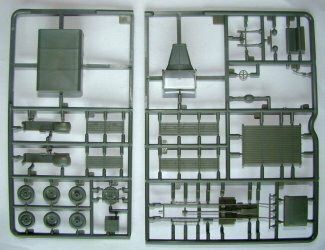 The kit has been designed as a quick build for wargaming, although it is relatively complex for a quick build kit, and demands some modelling skills, especially to remove parts. 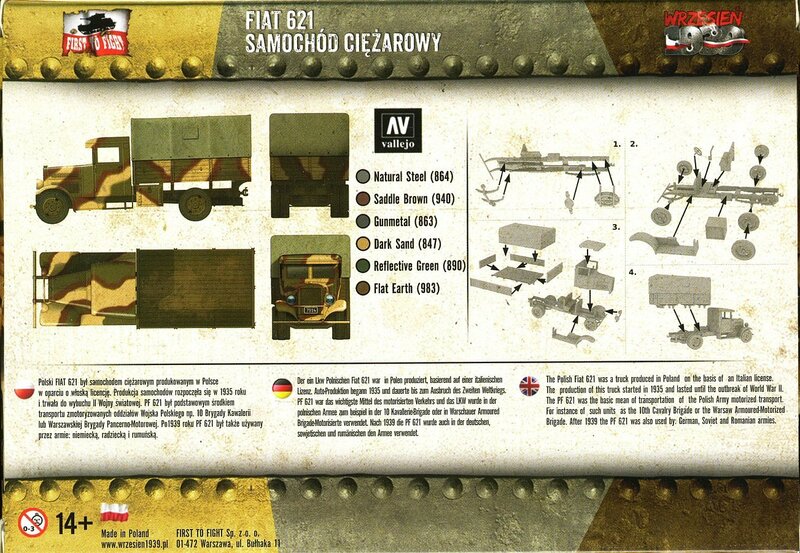 The kit comes with a booklet (actually the kit is a "bonus" to the periodical booklet) which is in Polish only, and contains some information about the vehicle, several low-quality photos and big painting scheme with the corresponding Vallejo paint call-outs, also repeated on the box. The box also contains a plastic tube of smelly glue. A basic, small sized assembly instruction is on the back side of the box, which, in case of this kit, is not a good idea. Firstly, you can't figure out the rear axle orientation. There is a small nub that sticks out from the differential cover (probably representing the drain plug for the differential lubricating oil) that should be glued facing to the rear of the truck (there is a larger picture of the instructions here, which gives a clearer view). You also have to guess how to assemble the box's walls. In the case of the side walls, the horizontal laths should be orientated so that the tiny locks are on the rear edge (part 19 is left side wall, part 20 is right side. It would have been nice to have the part numbers on the instruction diagram). In the case of the rear wall, there are two bulges on it, that should face out, with the flat surface facing up (they are covers for the steps, that were cut off in the rear wall, and used when the wall was hinged down). The location of the remaining parts is pretty obvious. 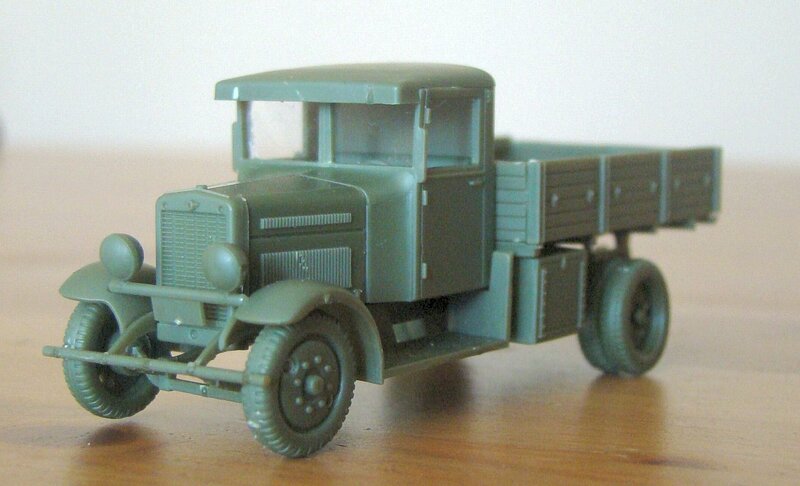 The cab is cast as a single part, apart from the roof. The chassis frame has a total of 21 rather thick attachment points, five of which are on the thin bumper, and removing the frame requires some careful cutting (personally, I find a razor blade most useful for this job, but even then I broke one of the rear springs). The plastic is quite soft and easy to work with, however the parts will have cut marks which should be sanded out and painted, especially on the tubular fender. There is no problem with parts fit. There are several ejector marks on underside of side steps and platform. 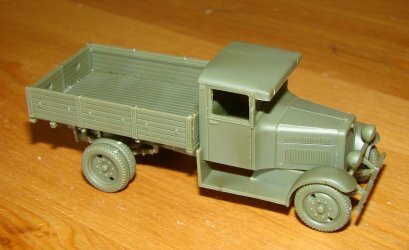 The truck can be built with an open cargo platform or with a canvas top which is closed at the end and comes as a single part. The box's rear wall can be assembled open. 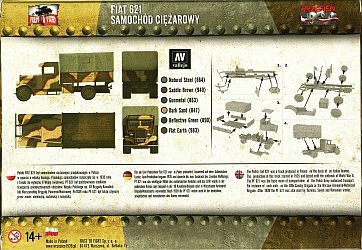 It looks like there will be another variant of this kit, with an infantry heavy machine gun model wz.30 on an anti-aircraft mount, which was removed from the sprues in this kit. The kit is not supplied with transparent parts for the windows, so they must be custom-built (which is not complicated, since they are flat). The photos of the provisionally assembled kit show a custom-built front window. There are no decals, although there should be some for the registration plates used on Polish cars. There is a plate mount on the bar between the front lights. There is no rear plate mount in the kit, which should be under the left side of the box. Details are sharp and subtle in my opinion, especially the side vents. Despite the fact that the radiator looks unnatural on magnified photos, the effect looks correct when viewed from a normal perspective. The badge over the radiator is not oversized, unlike that in the MarS model. On the other hand, the FTF model has a plain bench in the cab, while MarS has a comfy-looking couch, which is probably more original. There is no dashboard, but it would not be visible anyway. Planks of the box look nice and sharp, despite there is no wood grain present, as found on the MarS kit. There is no information in the kit on what colour the interior and chassis should be painted. According to 1938 instructions, the cab interior should be painted black up to level with the seats' backrests, and light gray above that. 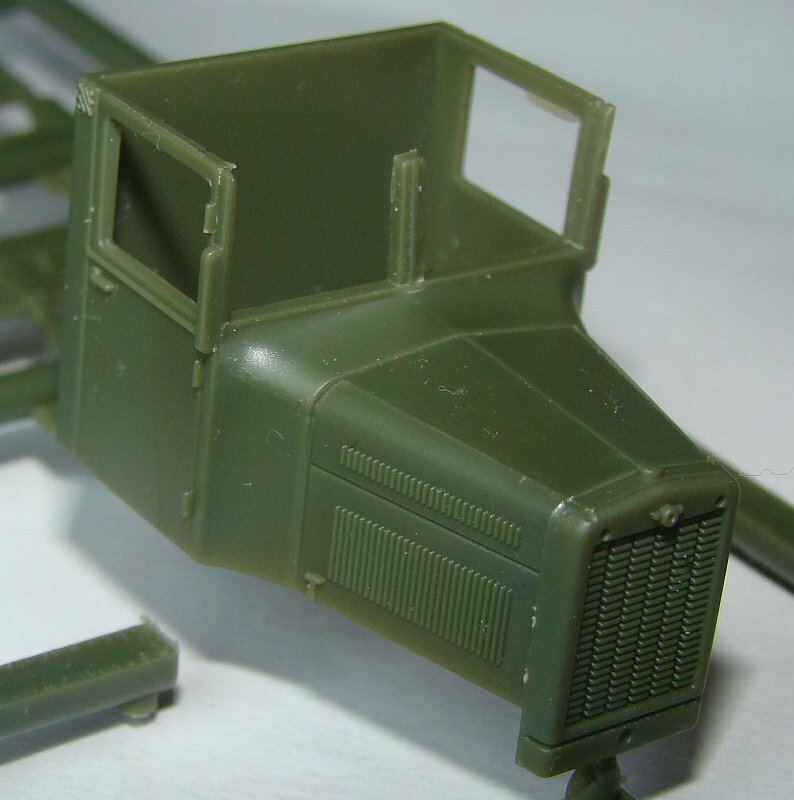 The chassis should be painted with a basic olive green, but parts on the chassis should be black. Engine block should be gray. As far as I know, there are no plans published of this truck. The only source of dimensional drawings is a color 4-view 1/35 drawing by Adam Jo&nacute;ca in "Wrzesie&nacute; 1939 - Pojazdy Wojska Polskiego", published in 1990. However, these plans show a truck that's a bit too short, since the author did not know exact length and wrote "about 5700 mm". 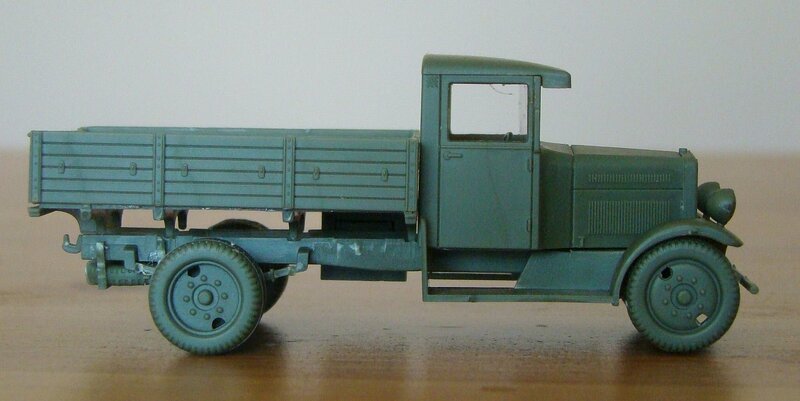 As the above shows, the model's length is correct, but the wheelbase is a bit too long. It can't be corrected by moving the rear wheels, for it would spoil the proportions in the rear part. Drawings suggest, that the front axle with fenders should be moved some 1 mm rearwards, although there is no clear difference on photos and it is definitely not worth the effort. 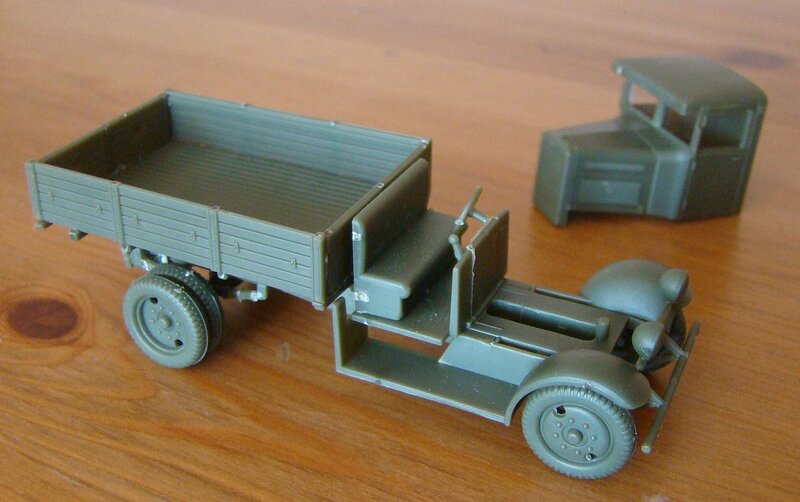 Difference in width is negligible, although one might be tempted to shorten a rear axle a bit. On some Polish modelling forums there can be found some criticism regarding the car's radiator and bonnet, being allegedly too wide. However, radiator's width agrees with A.Jo&nacute;ca's drawing, and it is the same, as in the acclaimed PF 621 resin model by MarS. Also, I do not find it oversized, comparing with photos. It should be noted, that most photos show a radiator with a plain mesh, but some photos show a radiator with six columns of horizontal elements, and two holes above, as depicted in the kit - it was probably a variation. A detail, that really may raise doubts, is a rectangular roof and parallel cab sides in the model, while the drawing by A.Jo&nacute;ca shows the vehicle with a slightly trapezoidal roof and the cab narrowing towards front (equaling out to some 1580 mm at the rear wall and 1365 mm at the windshield, while the kit measures 1580 mm through all the cab's length). It can not be judged from available photos, which is correct. The MarS resin kit has narrowing cab and roof. The lack of a rectangular rear window, which is seen on the drawing and photos that I've examined (dimensions are 570x210 mm according to the drawing), is an omission. Also, the rear wall of the cabin should have vertical planking. Both these features are present in the MarS kit. Large headlights agree with the drawing, although it is a pity they are not transparent. 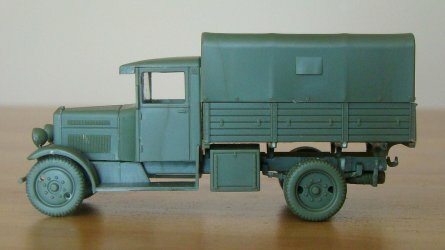 Advanced modellers might supply the kit with a round rear view mirror, which should be fixed to the left side of a window frame with two thin rods. A minor inaccuracy concerns the mounting of the canvas top: in the kit it simply sits on top of the box's sides, while in fact it should cover the two upper planks of the box (the cover's edge should be just above hooks on the sides, used to lace up the canvas). The hooks themselves are nicely molded and advanced modellers could add laces between them and holes in edges of the canvas. Number of planks in sides (six) and their look is correct, contrary to the MarS kit, which has a larger number of too narrow planks. MarS kit has additional locks on sides to mount higher side racks; their lack is not an error. The chassis of the model is simplified, but there is no documentation available. 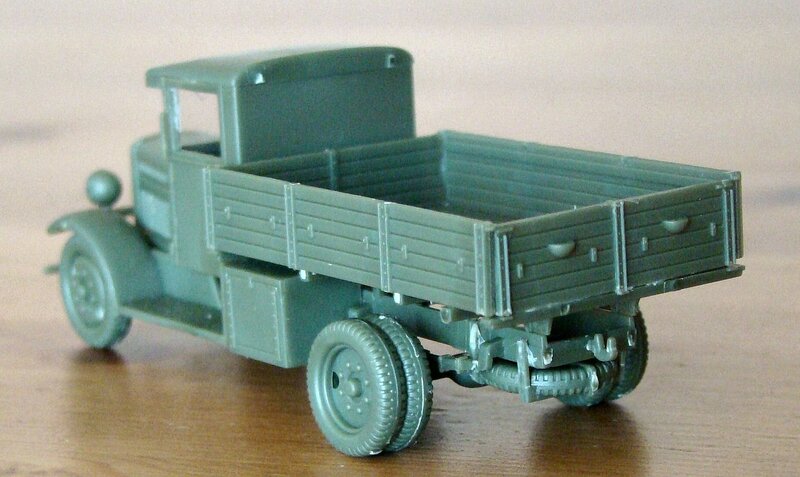 There are nicely molded leaf springs, front axle, lower part of the engine and a drive shaft. 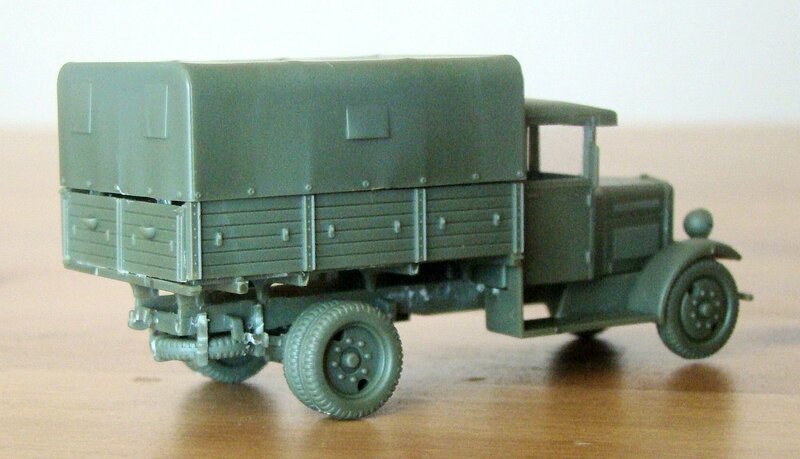 The connection of the drive shaft with the rear axle however looks very suspicious and unusual, and is different, than in the MarS kit. The latter has an ordinary slanted drive shaft, joined directly to the differential, which seems more probable. Also missing is a muffler, which should be on the right side. Wheels are nicely molded, have a correct size and look, except for rear wheel hubs, which are somehow too shallow, but they are acceptable in my opinion. I can recommend this model even though it is intended for wargamers. Even if it has some inaccuracies, it has a nice general look and sharp details. 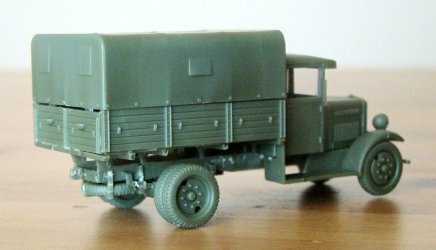 It is a good rendition of a typical Polish Army truck, especially useful for dioramas. In most aspects it is not worse, than MarS resin kit, which costs over three times more.